Making sure that mums-to-be are in the best possible health is key to ensuring their baby gets the best possible start in life. But what sorts of things can help them achieve that? In this episode of the Child of our Time Podcast, Professor Hazel Inskip from the MRC Lifecourse Epidemiology Unit at the University of Southampton, talks about an ongoing trial making use of healthy conversations and Vitamin D supplements to try to improve the diet of just pregnant women. This entry was posted in Research and tagged Babies, BMI, Children's Health, Development, Diet, Equality, Infant feeding, Maternal health, Maternity, Nutrition, Obesity, Overweight, Physical Activity, Pregnancy on November 29, 2016 by Christine Garrington. Child obesity figures appear to be on the rise again, causing much concern after earlier signs they had levelled off. The proportion of 10- and 11-year-olds who were obese in 2015-16 was 19.8 percent, up 0.7 percent on the year before. There was a rise of 0.2 percent among four- and five-year-olds. The announcement comes as researchers at the ESRC International Centre for Lifecourse Studies at UCL have been looking in detail at how and when children become overweight. The team has also been asking whether children who are overweight are more likely to go on to smoke and drink alcohol and if their mental health suffers as they become adolescents. Yvonne Kelly explains the research findings, and considers their implications for the Government’s recent strategy for tackling the childhood obesity epidemic. The Government’s much-awaited and much-debated childhood obesity strategy was published in August. In the end, it was less comprehensive than had been anticipated, less draconian too. It focuses on two things – reducing sugar consumption and increasing physical activity. But will it be effective in reversing this worrying obesity trend among our children? It’s fair to say we don’t fully understand what things influence whether, when and why a child might become overweight. Research to date has shown three distinct weight pathways for children: a healthy BMI throughout childhood; becoming overweight during childhood and being overweight/obese throughout childhood. Previous research has also shown that the child’s mother’s weight, smoking in pregnancy, mental health and other social and economic factors have some link to childhood obesity. But the evidence is far from complete and, where a child’s own mental health is concerned, it’s not at all clear which way the association works. To try to get a clearer picture of all these things, our research looked at the BMI paths of the participants in the Millennium Cohort Study, which has tracked the lives of nearly 20,000 children born between 2000-2002. We used data collected at birth, 9 months, age 3, 5, 7 and 11. Once we had established who was on which BMI path, we were able to look at what factors were at play in their lives and to see whether a tendency to overweight and obesity was an indication that a child would go on to face mental health difficulties in early adolescence or start smoking and drinking. The BMI data for the 17,000 children we were able to look at for our study showed four distinct groups of children. More than 80 per cent of them stayed on an average non-overweight path throughout their childhood – we call it the ‘stable’ path. There was a small group (0.6 percent) of children who were obese at age 3 but were then in the stable group by age 7. We call them the the ‘decreasing’ group. 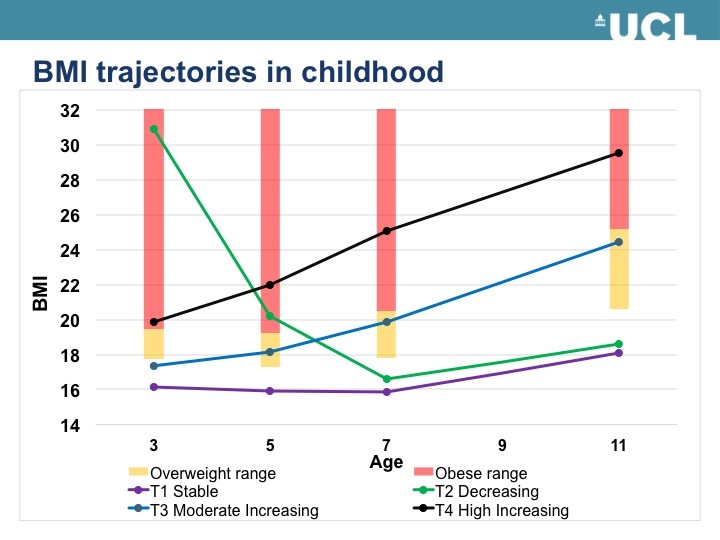 There was a ‘moderate increasing group’ (13.1 percent) where children were not overweight at age 3 but whose BMIs increased throughout childhood into the overweight (but not obese) range. Finally we had a ‘high increasing’ group of children (2.5 percent) who were obese at age 3 and whose BMIs continued to increase. Girls were 30 percent more likely to be in the ‘moderate increasing’ group than boys and were half as likely to be on the ‘decreasing’ path. Indian, Pakistani and Black African children were up to two times more likely to be on the ‘moderate increasing’ path whilst Pakistani, Black Caribbean and Black African children were up to three times more likely to belong to the ‘high increasing’ group. The wealthiest children were least likely to be in the ‘moderate increasing’ BMI group and children of mums who smoked during pregnancy were up to two times as likely to belong to increasing BMI groups. Children with overweight mums were most likely to be on the moderate and high increasing paths. Children on the moderate and high increasing paths were less likely to have regular family routines – they were more likely to skip breakfast or have non-regular bedtime schedules. Interestingly, however, no strong links emerged with some of the things more readily linked with childhood obesity such as sugary drinks and snacks, watching TV and lack of physical activity such as sports, the main focus of the newly published childhood obesity strategy. So it seems quite a large range of factors influence the likelihood of a child becoming overweight or obese over the first decade of their life. On top of this, being overweight or obese would also seem to point to a less happy and fulfilling early adolescence and a tendency to explore risky behaviours like smoking and drinking. Although our research did not show a clear link with sugary drinks and snacks, there are nevertheless some compelling arguments for reducing the sugar intake of our children. These are not only related to problems of obesity, but to wider issues including the major issue of tooth decay and associated emergency hospital admissions. There is also increasing evidence of the ‘addictive’ nature of sugar with research suggesting that it stimulates a sort of ‘reward path’ in certain centres of the brain meaning that the more we have the more we want. It has been shown that people who reduce their sugar intake tend to crave it less. Where sugar taxes have been introduced in other countries (Mexico, France, Denmark, South Africa amongst others), the intervention has been shown to help reduce the consumption of sugary drinks. As yet, there is no evidence that it helps reduce BMI and tackle obesity, but it’s argued it will take time for us to see an effect on whole populations. It is hard to predict how much impact the voluntary rather than mandatory reduction in sugar content of drinks and snacks agreed in the strategy will have. As for the sugar tax that will be introduced in two years’ time, there remain concerns that disadvantaged families more likely to purchase and consume sugary goods than their better off counterparts will be hardest hit. Policy makers will need to think hard about how any negative consequences of this might be counteracted. Our research shows clearly that when it comes to the likelihood of a child becoming overweight or obese in the first decade of their life, there are many more influences than just sugar. Those influences are at play in families even before our children are born. Helping pregnant women to stop smoking and maintain a healthy weight, making sure all young children have healthy eating and sleeping routines would seem to be key, together with targeted support for the ethnic and social groups identified as being most at risk. BMI development and early adolescent psychosocial well-being: UK Millennium Cohort Study is research by Yvonne Kelly, Praveetha Patalay, Scott Montgomery, and Amanda Sacker. The work, published in Pediatrics, is funded by the Economic and Social Research Council. Are children becoming obese earlier? This entry was posted in Research and tagged Adolescent, Alcohol, Babies, Birth, BMI, Breastfeeding, Childhood obesity strategy, Children, Children's Health, Development, Diet, Exercise, Happiness, Health, Inequality, Infant feeding, Maternal health, Maternity, Mental health, Millennium Cohort Study, Nutrition, Obesity, Overweight, Physical Activity, Pregnancy, Smoking, Socio-emotional difficulties, Sports, Sugar, Teenager, Young people on November 11, 2016 by Christine Garrington. Bowel cancer is the third most common cancer among men worldwide, with nearly 1.4 million new diagnoses each year. Links with obesity in adulthood are fairly well established with what appears to be a rise in risk with increasing body mass index. The link is significantly stronger for men than it is for women. Much less is known about potential causes at earlier stages of life, especially adolescence, as Professor Scott Montgomery from UCL explains. Adolescence marks the transition from childhood to adulthood and is a period of accelerated growth, especially for men. We wanted to look at whether obesity, or even just excess weight, during the teenage years increase the likelihood of colorectal cancer later in life? Asking men diagnosed with bowel cancer what they weighed as teenagers is not a reliable source of data. What we needed to examine this question robustly was a large sample of men who were accurately measured in their youth and are now sufficiently old for a significant number to have developed bowel cancer. One such group is men who experienced compulsory Swedish military conscription assessments. Around a quarter of a million young men aged around 18 years were assessed for conscription between 1969 and 1976. After excluding those with errors in the original measurements and excluding men with pre-existing medical conditions gave us a sample of just under 240,000 – equivalent to 8 and half million person years of data. The men’s height and weight was measured by trained personnel during the conscription examination. From these data body mass index (BMI) or kg/m² was calculated and those numbers were put into five groups – underweight (BMI of less than 18.5), normal (BMI of 18.5 to 24.9), lower overweight (BMI of 25 to 27.4), upper overweight (BMI of 27.5 to 29.9) and obese (BMI of over 30). A blood test was also taken and tested for signs of higher levels of inflammation, which can signal diseases processes relevant to bowel cancer risk. Over an average of 35 years following conscription, 885 of the men were diagnosed with bowel cancer, comprising 501 cases of colon cancer and 384 cases of rectal cancer. Men who had been underweight in adolescence had a slightly lower risk of a colorectal cancer diagnosis than normal weight men. Lower overweight men had a non-statistically significant higher risk, upper overweight men had a statistically significant 2.08-fold higher risk and obese men had a 2.38-fold higher risk. Men, who had suffered high levels of late adolescent inflammation, were found to be at a 63% higher risk of being diagnosed with bowel cancer than those with normal levels. The link between BMI and a diagnosis was independent of inflammation levels, suggesting adolescent BMI may be operating in a different way and through mechanisms other than the inflammation detected during adolescence. The average age at the end of follow-up was 53.9 years, so our analysis did not look at any changes in late adulthood. It seems unlikely, though, that the upper weight groups would suffer less in later years. It was also impossible to account for whole life measures of BMI and inflammation and so we are not able to comment on whether the strong association between adolescent BMI and bowel cancer could be mitigated by weight loss during adulthood. It is, however, plausible that it is the total duration of exposure to high BMI or inflammation that brings the increased risk rather than exposure at a specific age. High BMI or inflammatory processes already present during adolescence may persist for many years into adulthood. It is also important to stress that the findings do not necessarily apply equally to women. Certainly, other studies have shown the associations between BMI and inflammation and bowel cancer are weaker among women than men. All that said, this is a robust, important study based on good quality measurement and a lengthy time frame. At a time when increasing adolescent obesity in the United States, for instance, appears to be being followed by an increasing incidence of bowel cancer among young adults, it contributes to the case for further work to be undertaken with some urgency. What our research does suggest is a graded association between adolescent inflammation and bowel cancer and an even stronger association between adolescent BMI and the risk of bowel cancer in men. We have notable evidence of a link between these exposures at a particularly vulnerable stage of development and the later incidence of bowel cancer. More work needs to be done, particularly to clarify how inflammation and BMI act or interact to affect an increased risk of bowel cancer. Further research is also needed to disentangle these factors from other risks both in adolescence and later life. Adolescent body mass index and erythrocyte sedimentation rate in relation to colorectal cancer risk is research by Elizabeth D Kantor, Ruzan Udumayan, Lisa B Signorello, Edward L Giovannucci, Scott Montgomery and Katja Fall and is published in the journal, Gut. This entry was posted in Research and tagged Adolescent, BMI, Bowel cancer, Colorectal cancer, Conscription, Health, Inflammatory markers, Obesity, Overweight, Sweden, Young people on June 15, 2015 by Christine Garrington.